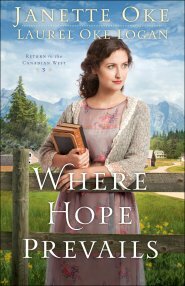 When Beth Thatcher returns to Coal Valley, she has much to be excited about. She anticipates Jarrick's proposal of marriage and perhaps a spring wedding. The mine is expanding, and there are more schoolchildren than ever. But the town's rapid growth brings many challenges. A second teacher is assigned, and Beth finds herself going head-to-head with a very different philosophy of education--one that dismisses religion and rejects God. Fearful for the children who sit under the influence of Robert Harris Hughes, Beth struggles to know how to respond. At the same time, Beth wonders if Jarrick is considering a position at her father's company simply for her sake. Should she admit her feelings on the matter? Or keep silent and allow Jarrick to make up his own mind? Purchase the book HERE. Bestselling author Janette Oke is celebrated for her significant contribution to the Christian book industry. Her novels have sold more than thirty million copies, and she's the recipient of the ECPA President's Award, the CBA Life Impact Award, the Gold Medallion, and the Christy Award. Janette and her husband, Edward, live in Alberta, Canada.